You can't get enough of Zeb Carter! Boxset containing Death Club, Trigger Break, Scorched Earth and RUN! ALONG with Zeb Carter. 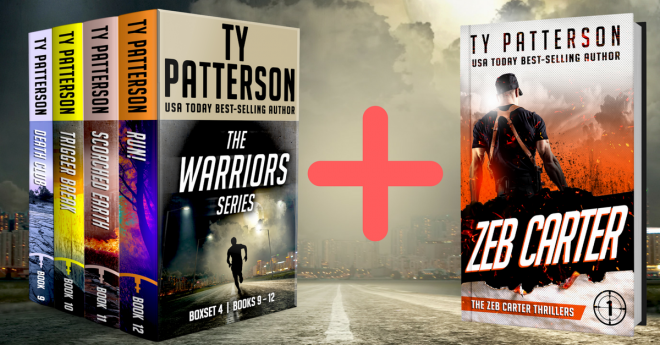 Five of the most recent Zeb Carter and his Warriors books. Download Mobi format for Kindle, ePub for all other readers. When Beth and Meghan Petersen are kidnapped, Zeb Carter goes on the warpath. The trail leads him to Syria where he comes across an enemy who is a master at dealing in death. The remote wilderness of Idaho has become home to Namir, the most wanted terrorist in the world, who is planning a vicious attack on America. Zeb Carter is in the same jungle. He has to protect an innocent, stop Namir, and combat the terrorist's newest ally, a Mexican cartel. But this time, he can't afford to die as long as the terrorists are alive. Villagers have a special name for the mountain on which Sori is perched. Mountain of Death. Sori also where the Taliban hold three American soldiers captive. All attempts to free them have failed. Military operations and negotiations have proved fruitless. On the Mountain of Death, the one person who might have the slightest chance is the man who doesn't fear dying.